To begin, Cairo presented the audience with a scatter plot chart from the Pew Research Center. He explained the chart—a simple display of regional sugar intake versus the number of decayed teeth in each region—and revealed that only 63 percent of American adults can correctly understand the graphic. Is the designer or writer using the right data and disclosing its origin? Cairo emphasized that charts aren’t meant to be seen; they’re meant to be read. Are you reading too much into the graphic? Don’t allow personal biases to get in the way of understanding graphics, because a chart can show as much as it hides. Is the data represented accurately? If there a disconnect between the title and the data visualization, the graphic is most likely incorrect. Is the graphic showing an appropriate amount of data? Ensure that the visualization reveals the context of the data, and not just bare numbers. Is uncertainty relevant? If so, is it revealed? If the graphic’s margin of error would change the visualization, verify that is expressed. Cairo emphasized the importance of paying attention and urged the audience to think critically when it comes to media consumption. Being wary of common clichés and misconceptions in article titles, such as “This chart speaks for itself” or “This graph shows everything you need to know about [subject],” which can reveal faulty information as well. Learn more about Alberto Cairo’s work on his personal website and lecture tour website. 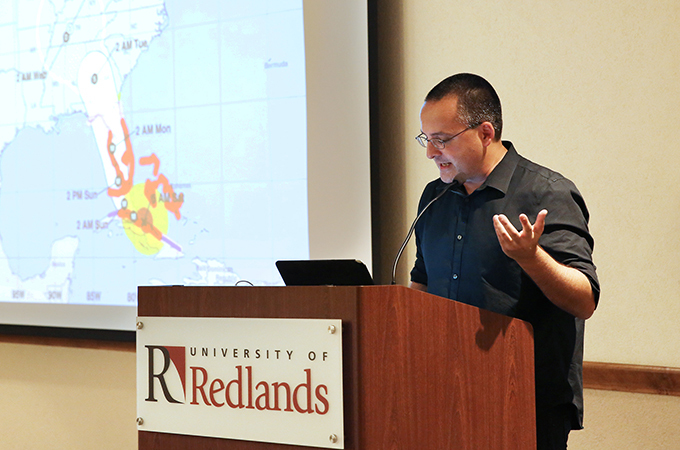 The recent talk was part of the Redlands Forum, which is co-hosted by Esri and the University of Redlands Town and Gown. Next up in the series is “Black Nightingales: Lady Day, Ella, and Sassy” by University of Rochester’s vice president, Dr. Paul Burgett, on Wednesday, November 8, from 5:30 to 6:30 p.m., registration required. For more information, see the Redlands Forum website.